To access the various signals on Crystal Vision's interface and keying boards you need rear modules, which slot on to the back of the rack frames. Crystal Vision offers a wide choice of these rear modules which provide varying numbers of inputs, outputs and loop-through options to suit all applications, along with a choice of different connectors. Rear modules are usually ordered at the same time as the boards. Most boards offer a selection of rear modules, with the rear module chosen depending on the signals that need to be accessed. The Indigo frame system and Vision frame system use their own rear modules. Easily identifiable, the Indigo rear modules are named RMxx, while the Vision rear modules are named VRxx. 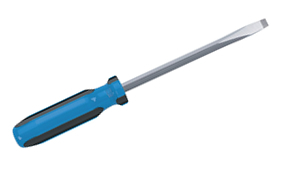 The Indigo rear modules (RMs) are 104mm long and can fit up to six BNCs in a single slot. The Vision rear modules (VRs) are slightly longer at 115mm, and can therefore fit up to seven BNCs in a single slot. Each rear module provides a selection of labels for different products, giving useful information about the signals being accessed through the connectors. There are three sizes of rear module available: single slot (uses one frame slot), double slot (uses two frame slots) and quad slot (uses four frame slots). The Indigo single slot and double slot rear modules can be used with all three frame sizes (2U, 1U and desk top box), while the quad slot just fit the Indigo 2U frames. The Vision single slot and double slot rear modules can be used in the Vision 3 3U frame. Sometimes two Indigo single slot rear modules are used together to create a double height rear module. Which Indigo rear modules are available? 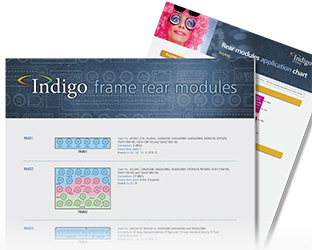 To view the current Indigo rear modules, including a picture of each one and the boards they are used with, please download the Current Indigo rear modules document. To view the inputs and outputs you'll get with each rear module, please download the Indigo Rear Modules Application Chart. Look on the individual product pages for more information on the rear modules used with the products, including advice on which one you should choose for your application. The latest Indigo rear module to be released is the RM77. Which Vision rear modules are available? 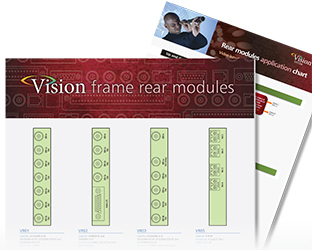 To view the current Vision rear modules, including a picture of each one and the cards they are used with, please download the Current Vision rear modules document. To view the inputs and outputs you'll get with each rear module, please download the Vision Rear Modules Application Chart. The latest Vision rear module to be released is the VR22. The rear modules each come with different connectors to suit a variety of signals. 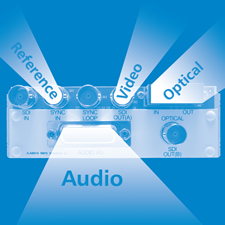 BNCs are most commonly used – mainly for video inputs, outputs and loop-throughs, but also for reference signals and 75 ohm AES audio. You can find BNCs on both the Indigo and Vision rear modules. Traditionally liked for their rugged quality, D-Types are used principally for 110 ohm AES and analogue audio and also for accessing reference, metadata and GPI signals. Crystal Vision makes use of the following five D-Types: 9-way standard density, 15-way standard density, 25-way standard density, 26-way high density and 44-way high density. D-Types are used on both the Indigo and Vision rear modules. RJ45 connectors are used for the Ethernet transfer of logos and clips from the graphics PC to the MultiLogo logo keyers and Clip N Key clipstores, while RJ45 connectors are additionally used with these products to provide easy RS422 control by Sony or VDCP protocol using standard RJ45 leads. 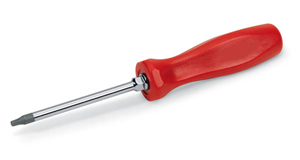 RJ45 connectors are also used to provide one-to-one RS422 wiring from the CoCo 3G Controller control panel straight to the board, and to provide a control loop-through which allows a number of boards to be wired to the same control panel just by daisy-chaining RJ45 leads. RJ45 connectors are used on just the Indigo rear modules. Finally input and output fibre connectors provide an easy way to get fibre input or output straight into the board, and are used with either the dedicated fibre transmitter and receiver products or with the fibre options (FIP, FOP, FIO, FIP-VF, FOP-VF and FIO-VF). 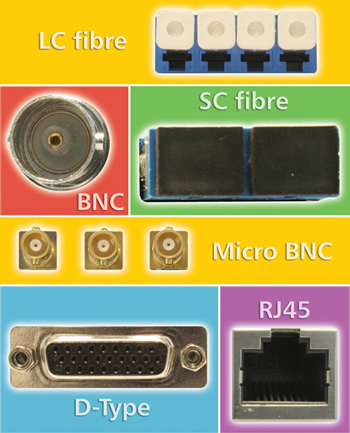 SC fibre connectors are used on the Indigo rear modules and LC fibre connectors are used on the Vision rear modules. Traditionally the Indigo rear modules were held on by retaining straps, whereas the current screw-in rear modules are individually held by two screws which makes it easier to change the rear module if required. The latest generation of Indigo frames have been designed with additional fixing holes to accommodate these screw-in rear modules, but even if you’re still using the older Indigo frames and rear modules there’s full compatibility: you can use the retaining-strap rear modules on the newer Indigo frames and you can use the screw-in rear modules on the older Indigo frames – you just take the screws out. The Vision cards plug directly into the rear modules, rather than via a full backplane, meaning that much higher video bandwidth is achievable. Each Vision rear module has two frame connectors - one that plugs into the Vision card and another that plugs into the frame backplane PCB for mechanical location. Vision rear modules are removed by firstly removing the associated card and then unscrewing the screws at the top and bottom of the rear module before carefully pulling it out. The double slot and quad slot Indigo rear modules have positioning rules which must be followed. There are no positioning rules for the single slot rear modules. The double slot Indigo rear modules must occupy either the upper or lower pair of frame slots. The board is always placed in the upper of the two slots, with the exception of the RM74 where the board is placed in the lower slot. The quad slot 'video' rear modules (RM02 and RM25) are used with three boards. These boards should be placed in the top slot, the next slot down and the bottom slot – leaving the third slot empty. The quad slot 'audio' rear module (RM14) is also used with three boards. These boards are placed in the top three slots, leaving the fourth slot empty. The only positioning restriction with Vision 3 is that dual slot rear modules (and cards) cannot straddle slots 10 and 11. When used with a dual slot rear module, a Vision card must sit in the right hand slot of the rear module as viewed from the front of the frame.